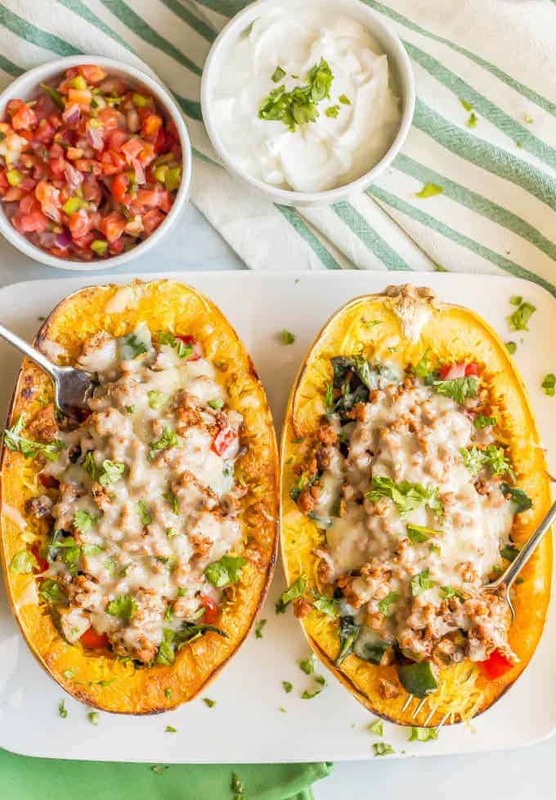 These turkey taco spaghetti squash boats feature tender roasted spaghetti squash stuffed with taco-flavored ground turkey and spinach, mushrooms, peppers and zucchini, plus cheese and pico de gallo, for a light but filling meal. 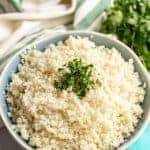 Low-carb, gluten-free and can be made whole 30 and paleo friendly. I feel like I have so much to tell you! M had the daddy-daughter dance at her elementary school on Friday night. They had so much fun dancing and laughing. She came home saying, “Dada’s such a good dancer!” Super sweet. We had a family putt-putt outing on Saturday afternoon. J, who is 4, got two back-to-back holes-in-one! ⛳️ It was crazy! I’m headed to California for a few days this week for a blogging conference and I’m so excited to see some friends and learn more about this wild business. So you guys know I love my spaghetti squash meals, right? They are such a perfect little vehicle for all kinds of yummy fillings. 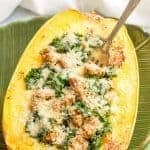 I’ve made turkey sausage and kale stuffed spaghetti squash, spaghetti squash with pesto chicken, spaghetti squash with pesto, peas and shrimp and most recently, my southwest vegetarian stuffed spaghetti squash. 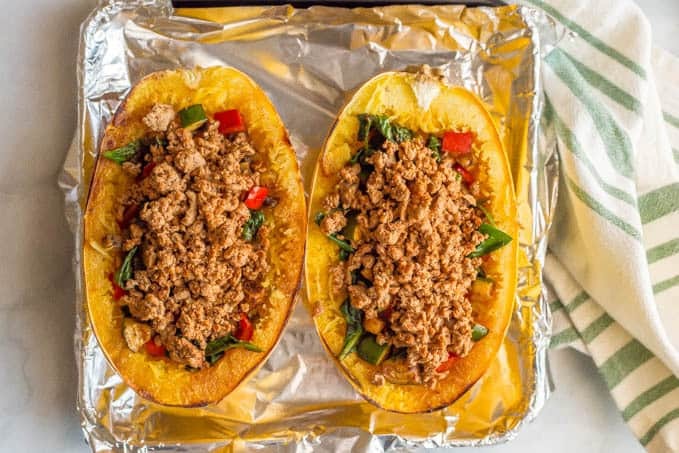 So today I’m bringing you my turkey taco spaghetti squash boats that are gonna be a new favorite way to do taco night! 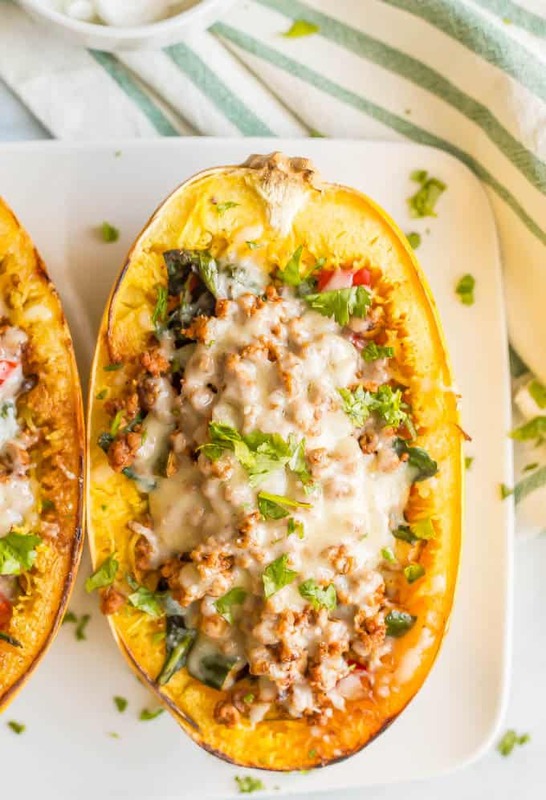 I could drool a little just thinking of all the veggie goodness going on with these stuffed squash. 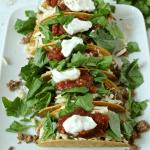 I love adding cheddar cheese to melt down over the top and then serving with pico de gallo and maybe a dollop of Greek yogurt, but you can use any of your favorite taco toppings. I cook the ground turkey and vegetables separately so that everyone can serve themselves with each. 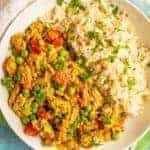 This also works great if someone wants a vegetarian version of this meal. Feel free to swap out any of the veggies and use your favorites. Just cut everything down to about the same size so they all cook at the same rate. Similarly, you could substitute ground beef or ground chicken — or use a mix — if that’s what you have on hand. You can absolutely add black beans to these spaghetti squash tacos. My husband often does that. 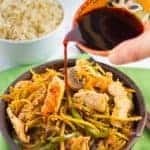 This is also an easy recipe to halve for a dinner for two. I use homemade taco seasoning, but store-bought is fine too. 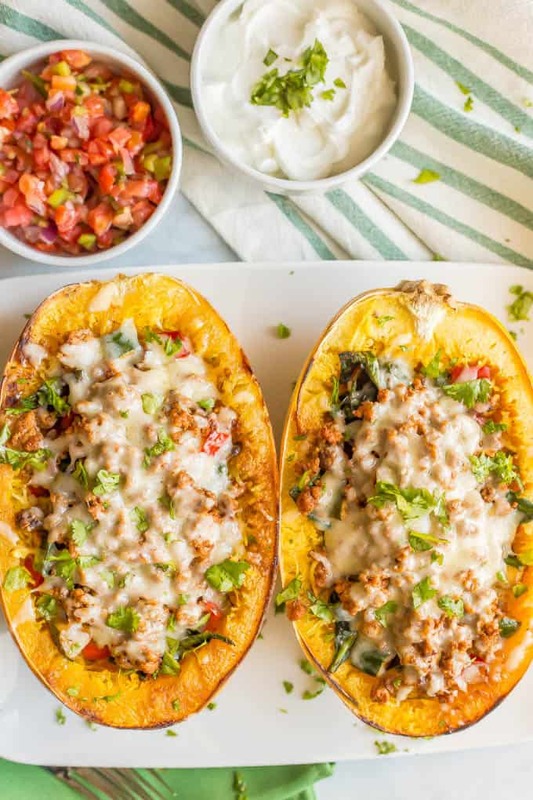 Taco night or any night, this is a fun, low-carb dinner that the whole family will want to dig into. 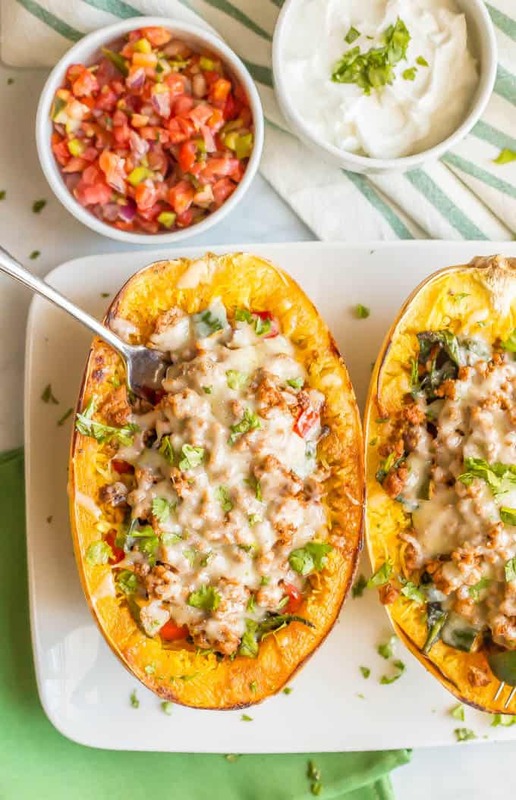 These turkey taco spaghetti squash boats are loaded with veggies and your favorite taco toppings for a light but filling dinner! Greek yogurt/sour cream, salsa or pico de gallo or fresh diced tomatoes, avocado, chopped cilantro, etc. Place each squash half, cut side down, on baking sheet. While the turkey cooks, heat oil in another large skillet over medium heat. Add the pepper, zucchini and mushrooms and saute until almost tender, about 5-7 minutes. Add spinach and stir until it’s wilted down, another 2-3 minutes. Season with remaining 1 tablespoon of taco seasoning. Once the spaghetti squash is cooked and cool enough to handle, use a fork to pull the spaghetti shreds from the inside of each squash half. Be sure to leave a little bit around the outside so the squash keeps its shape. Season each spaghetti squash half with a little salt and pepper. 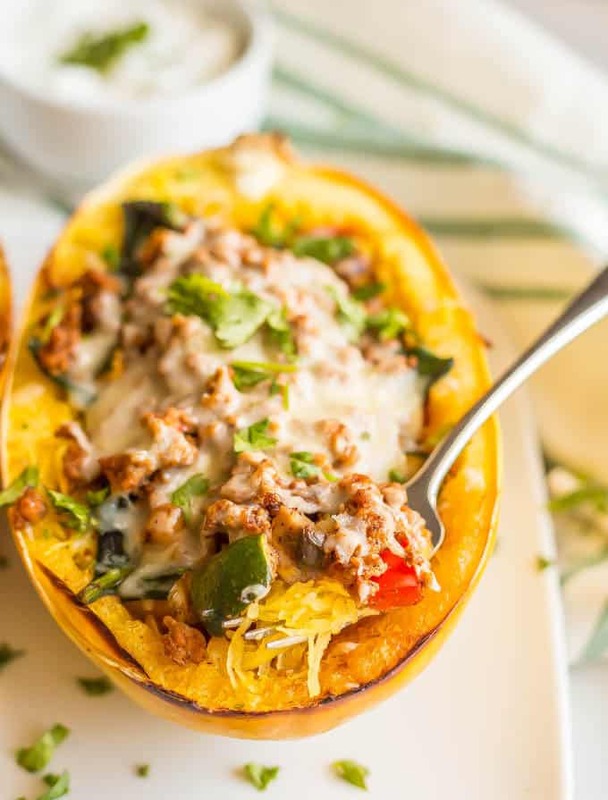 Divide the ground turkey and veggies among each of the spaghetti squash then top each with 1/4 cup of cheese. Return to the oven and cook for another 5-10 minutes, until the cheese is melted and everything is warmed through. Serve with any additional toppings and enjoy! 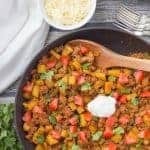 You can substitute ground beef or ground chicken — or use a mix — if that’s what you have on hand. Black beans also make a great addition to these spaghetti squash tacos.